(L-R) Floyd Mayweather defeated Manny Pacquiao in their world welterweight championship bout in May. Manny Pacquiao and Floyd Mayweather Jr. may give fans another chance to watch a fight they don’t really care to see a second time. Pacquiao, who recently announced his plans to run for the senate in the Philippines, told AFP that he has been in talks about a fight with Amir Khan and a rematch with Floyd Mayweather. 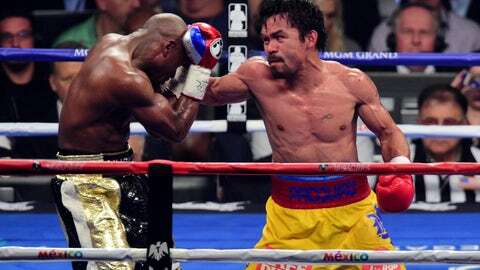 The Filipino boxer is 57-6-2 and coming off a unanimous decision loss to Mayweather in May. "I will fight anybody, anywhere," he said via AFP. "I am going to fight probably before the election. Pac-Man, 36, says his opponent will be finalized in November or December. Previously his promoter Bob Arum said they were considering Juan Manuel Marquez, Kell Brook and the winner of the Timothy Bradley-Brandon Rios fight as potential opponents. Spoke to @BobArum after the fight. He said the Pacquiao pool includes @AmirKingKhan Marquez, Brook and the Bradley-Rios winner. Arum repeated he'll discuss Pacquiao's choice with the fighter at a NY meeting around Oct. 12-13. Though Pacquiao reportedly said he has talked with Mayweather about a rematch, we wouldn’t hold our breaths on seeing one. For one, Mayweather said he was retiring after winning his last fight to make him 49-0, though many do not believe that was his last bout. Secondly, Pacquiao is aiming to fight in March or early April because he also has to be mindful about his senate campaign. Mayweather has strictly fought on a May/September schedule since 2009. It’s highly unlikely he would alter the schedule he has kept for years just to fit Pacquiao’s schedule. Lastly, Arum told Yahoo that he has not had talks with Mayweather and considers the boxer retired. Ultimately we would expect Pacquiao to end up facing Khan, and the two could commiserate about how difficult it is to deal with Mayweather.